Competing against players older than you can be an intimidating task for a young junior tennis player as the skills, development and sheer physical attributes can create a substantial mismatch. But don’t tell that to eight-year-old Noah Vinbaytel, who trains under Alex Roberman at MatchPoint NYC. Vinbaytel recently competed at the L2 Centercourt Pony Express Open in Florham Park, N.J. in the Boys 12s Singles Division, battling against kids almost four years older than him. But Vinbaytel did not let that affect him, taking out the top-two seeds on his way to the title, including second-seeded Joseph Yang, 4-1, 0-4, 10-1 in the championship match. Vinbyatel has been playing tennis since he was about two-years-old, and can remember when his father would toss him a foam ball in their living room as some of his earliest practices. He first started training at Mill Basin Racquet Club, a facility now run by MatchPoint NYC. From there, he was introduced to Roberman, and this is when his game really began to take off. His success at the USTA tournaments is a direct result of the work he has put in. He originally began playing with regular-sized rackets on regular-sized courts, but went back to the Orange Ball system, playing with smaller rackets on a smaller court. 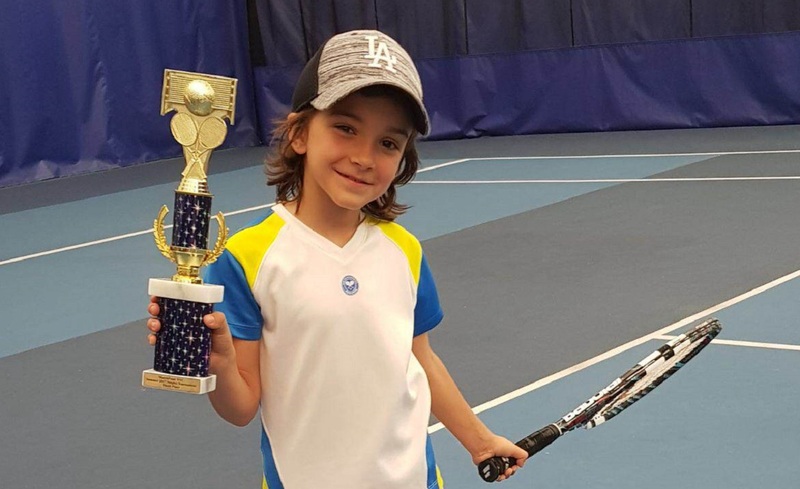 Vinbaytel showed great determination, competing every weekend in Orange Ball tournaments in order to move through the system, notching six first-place finishes and three second-place finishes, and is now competing in 12s Divisions of tournaments. “By the time he turns 11, I want him to be playing in 14s,” said Roberman. Those sorts of expectations, and the willingness to meet them, has turned Vinbaytel into a top junior. The next step for Vinbaytel is to get a little stronger and build up his strength, which will allow him to compete more consistently against older players. Vinbaytel has come a long way since his hitting foam balls with his father, and with the coaching guidance of Coach Roberman and the crew at MatchPoint, his game is only going to continue to grow in the years to come.